The bladder flap technique of ureteral reimplantation is a fairly simple technique that was readily applied to the laparoscopic field applying all the previously mentioned principles from open surgery. Fergany et al. 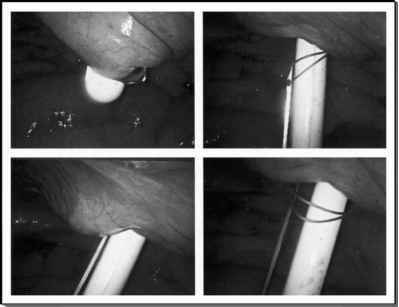 (5) described the laparoscopic procedure experimentally in a porcine model, performing direct as well as nonrefluxing anastomoses in six animals. No complications were encountered and anastomoses were all patent at the time of sacrifice. In the clinical arena, Boari flap reimplant was first reported by Fugita et al. in 2001 (6). In this report of three patients with various causes of lower ureteric obstruction, laparoscopic Boari flap reimplant was performed without complication and follow up extending to six months confirmed a successful result. All three reimplantations were performed directly without antireflux techniques, and operative time ranged from 120 to 330 minutes. No surgical complications were reported. Laparoscopic Boari flap ureteric reimplantation is a procedure that has moved from the experimental into the realm of laparoscopic urologic practice. The principles of open surgery can be duplicated with consistent results with a reasonable amount of laparoscopic suturing experience. In all reported cases, a three or four port transperitoneal technique was used, and the principles learned from the open surgical procedure were applied. Suturing the bladder flap and bladder closure can be performed using freehand suturing, which is probably easiest, or a suturing device. In our experience freehand suturing in this situation is usually straightforward because of the anterior longitudinal orientation of the suture line facilitating exposure and handling.